Dr. Avnish Sharma is a consultant Dermatologist and practices at Neelkanth Hospital in DLF Phase-III & Divine Look Skin Laser & Dental Clinic in DLF Phase I, Gurgaon. 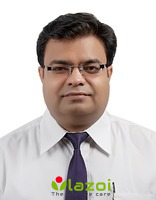 Dr. Avnish Sharma has completed MBBS from M.P. Shah Government Medical College in 1999 & DVD from Same College in 2002 and has expertise in Dermabrasion, Laser Resurfacing, Acne / Pimples Treatment, Anti Aging Treatment, Hair Fall Tretment, Photofacial, Glycolic Peel, Chemical Peel, Scar Treatment, Wart Removal, Leucoderma Treatment, Laser Hair Reduction etc. You can book an online appointment with Dr. Avnish Sharma on www.Lazoi.com.